Please note: You WILL dirty a lot of pots and pans. You WILL need copious amounts of gelatin, cream, egg yolks, more cream, various kinds of chocolate . . . and did I mention cream? Do NOT attempt to make this dessert in one day. Do NOT attempt to make it if the kiddies are under foot. Most of all, READ, RE-READ, and then RE-RE-READ the recipe. All that being said, is it tasty? Oh, Lordie, . . . YES. Despite the work, I would make this again. I am not usually a spoon licker, but I licked everything when I made this – spoons, bowls, beaters, you name it. I think I ingested several thousand calories worth of cream and chocolate just from licking cooking utensils. Luckily, I logged in 45 minutes on the elliptical machine, which should at least maintain the weight status quo. This type of French Yule Log is not the jelly-roll style of log that we think of in this country (made with genoise and buttercream), and that the Daring Bakers made last year. It is a frozen dessert made up of 6 components, all of which we were required to make. My flavorings were: Almond Dacquoise Biscuit, White Chocolate Mousse, Dark Chocolate-Caramel Ganache Insert, Nocciolata Praline (Crisp) Insert, Vanilla Creme Brulee Insert, and Dark Chocolate Icing. I thought that some of the instructions were a bit confusing, but the wonderful Tartelette provided helpful commentary. In fact, before you even attempt the dessert, I suggest you check out a lot of blogs for excellent tips and insight into the problems that many of the Daring Bakers confronted. Some suggestions: Apple Pie, Patis & Pate, Tartelette, Judy’s Gross Eats (listen to her problem with the 5-qt. KitchenAid bowl-I had the same issues), Baking Obsession, and Canelle et Vanille, just to name a few. If you want to see how 2,000 + other DBs did, check out the blogroll. I was swamped this month, so I had little time or energy for creativity. I stuck to the basic flavor parameters, and made a vanilla creme brulee (which never even got close to solidifying after two hours in the oven, but I froze it anyway). And I even used a water bath! All that aside, I think that I should write an ode to the vanilla bean one day. It does amazing things to dairy products, I must say. For the dastardly mousse, I used El Rey white chocolate disks, and cursed the size of my 5-qt. KitchenAid bowl. The beater couldn’t reach the ingredients in the bottom, so I was forced into a series of culinary gymnastics to get things to work, NOT a good idea when you are working with hot liquid sugar. I created a mess of spun sugar, said “eff it,” and carefully scooped out the pate a bombe so I wouldn’t pick up all the solidified sugar. “Pate a Bombe” describes egg yolks beaten with a hot sugar syrup which has been heated to the soft ball stage. 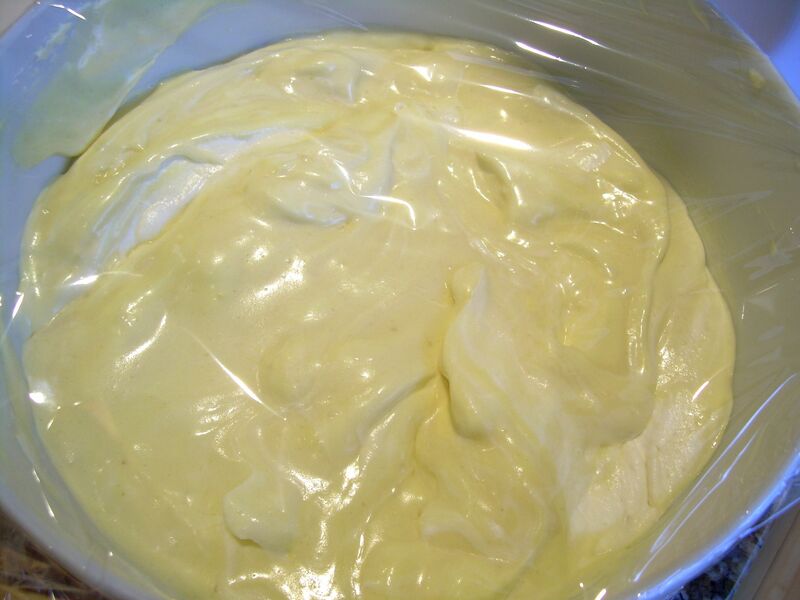 The mixture is the base for many mousse and buttercream recipes because it makes them more stable, particularly if they are to be frozen, so that they do not melt as quickly or collapse under the weight of heavier items. Personally, I think all of that is a bunch of baloney, and that a pate a bombe is part of a nefarious plot to drive Daring Bakers round the bend. In the end it all worked out. Of course, I licked the bowl, the piping tip, the beaters, etc. . . .
I’m not sure what happened here, but I ended up with an enormous amount of rice krispies, scantily clad in a whisper of chocolate. So naked were they, I think they were embarrassed. So, this whole “roll out the crisp between two sheets of wax paper” never happened. There was nothing rollable. My advice: cut the amount of cereal that the recipe calls for in half. I think things worked out here, too, because a lot of other Daring Bakers said that the crisp layer was too hard to cut through. I sprinkled my bronzed rice crispies on top of the mousse layer, and found that it was easy to cut later on. I have a LOT of chocolate rice crispies left, and will have to find a way to feed them to Master Chow. Chocolate rice krispie treats, anyone? I used my favorite baking chocolate for this, Valrhona 71%, which I get at Trader Joe’s. I love that stuff. To my utter shock, my caramel turned the perfect shade of amber on my first try. When I added the boiling cream to the caramel, however, a chunk of it refused to melt into the cream, so I did what any sensible baker would do – I fished it out with a spoon (people, hot caramel is dangerous stuff so don’t take any chances), let it cool, and ate it. Mmm, there is nothing like homemade caramel. And lest you think I was slacking, I licked all the bowls and spatulas and beaters used to produce this confectionary marvel. 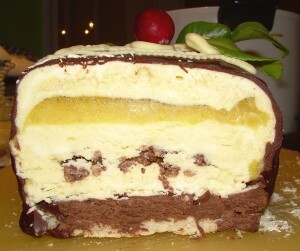 Nothing too difficult here, although I had never before made a dacquoise that had as much sugar added to the egg whites. I ended up with almost a marshmallow-like egg white mixture, which I incorporated into the almond flour/confectioner’s sugar concoction, and then baked it. I did add a little something when I was putting the dessert together: I made an amaretto simple syrup and brushed both sides of the dacquoise with it. Recipe: Mix 1/4 cup sugar with 1/4 cup water in a saucepan. Bring to a boil until sugar dissolves. Shut flame off and add 2 Tbsp. of amaretto liqueur to the mixture. Let cool, and brush on both sides of the cake layer. You will have some extra left over, which you can use in your coffee or hot toddy. Come to think of it, you may need a bit of caffeine and/or alcohol to get through this challenge. The directions for the dark chocolate icing were very confusing, but I managed to muddle my way through. I followed Tartellete’s advice and made a double batch of the stuff because she said it would make it easier to coat the log. Boy, was she right. My cocoa clumped, even though I sifted it, and I had to strain the whole thing through a fine mesh sieve. 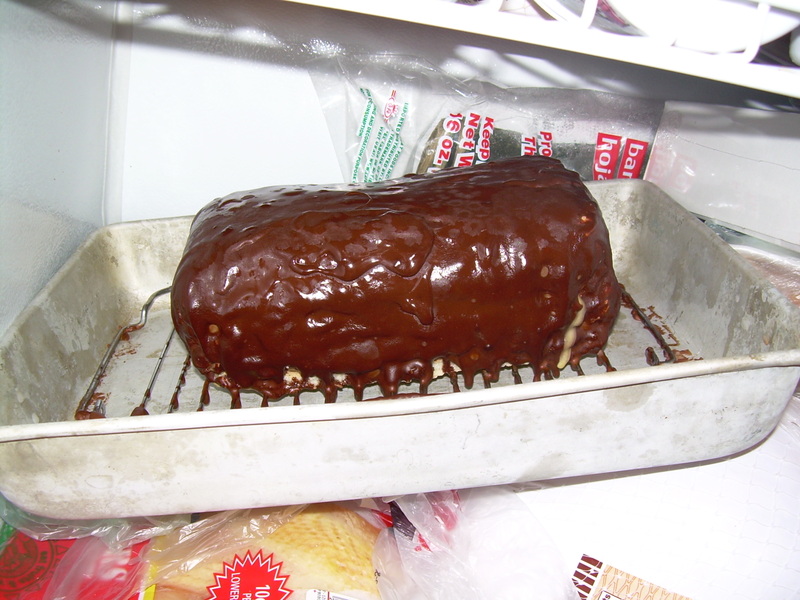 Then I didn’t let it cool enough, even though the icing coated the back of a spoon, and it started to melt my log. And, and, and . . . . I think you get the picture. This whole darn presentation thing is why I will not be a professional pastry chef. 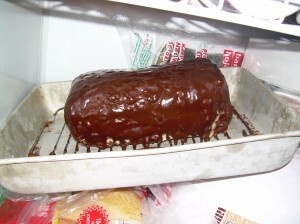 Decorating is NOT my strong suit, and if anyone can tell me how to get the icing to encase the entire log, I’m all ears. My log is naked and icing-less all around its bottom edge. 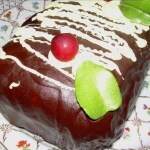 By the way, as the icing cools, it develops the texture of chocolate pudding. Really, really good chocolate pudding. I know because I ate a lot of it, and I have a stomach ache. Sigh. Back to the gym. This was a fabulous dessert, and most definitely a challenge. Thanks again, Hilda of Saffron and Blueberry and Marion of Il en Faut Peu Pour Etre Heureux! You realize, of course, that tasting everything is the trademark of an excellent chef! I’m sure it will taste great because of your sacrifices. The point where my spirits really sank was when I unmolded the loaf from the pan and saw all the hideous lumpy sides. How did everyone get such smooth sides? I almost can’t bear to even look at it now, but I can’t throw it away because of the huge investment in ingredients. It will either remain frozen in time forever, or I will unload it on someone. I have given some thought about remaking it, but if that’s the case, an intervention will be necessary. Ha ha ha ha! I laughed all the way through your post. Just for attempting such an elaborate dessert during the month of December qualifies you for an award. I quit while I was ahead, and dropped out. Just couldn’t keep up. 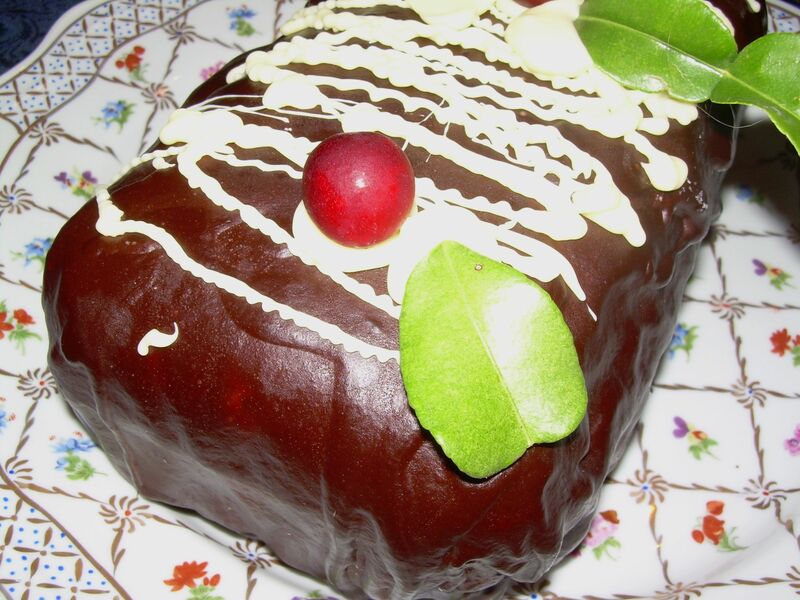 However, I think you did a great job, and it looks very delicious! Very well done! Your log looks great! The pate a bombe was definitely tricky stuff. I can’t even imagine making this without a thermometer now that I look back on it. Looking forward to your photos! I also thought about doing a white chocolate mousse but went with milk instead. Great job, all turned out very well! Happy new year! This truly looks like the Mother of all baking challenges. I am wowed that you attempted it, and in December no less! Your finished product looks beautiful! Definitely lickworthy, for sure. Happy New Year! That mousse looks delicious!!!! I bet it tasted amazing!!! Happy New Year!!!! At least you didn’t yell at Mr. Chow, and I’m sure he was impressed that you licked all the bowls and spoons 🙂 Your log looks great to me and I think the slightly naked rice crispies was the way to go for the crisp. Lovely job! Your post has me laughing…thank you! HAPPY NEW YEAR! It was really unreal for December! Lumps don’t matter – we learned, we survived! That’s what’s count. I think your log looks grand! Mine had a very patched look!! But an initial scare (looking at the recipe) and dirty dishes aside, this was a lovely challenge. I, too, made the pate a bomb but I had to use a 6qt mixer. Needless to say it took a little fidgeting and a few tricks I learned in cooking school to get the mixer to do its magic. I agree it was a little difficult to get to work correct and even blew it once myself. Nice to see you stuck it out and got it done in the end though. I too made spun sugar while I was supposed to making a pate a bombe. This way we’ll be ready if that ever comes up in DB challenge. Your log looks super. I know what you mean about the number of bowls and equipment messied up by his recipe. I think my girls almost resented this dessert as I made them do a lot of dish washing. lol! You log turned out beautifully! I love how you used the fresh leaves and berries. It looks really festive. After reading your and Judy’s issues with the large bowls on your KA mixers, I am now glad all I had to work with was my mom’s hand mixer and a smallish bowl for that portion. Lumpy or not it still looks fantastic! I’ve seen a bunch of yule log posts, and really enjoyed the way yours is written. 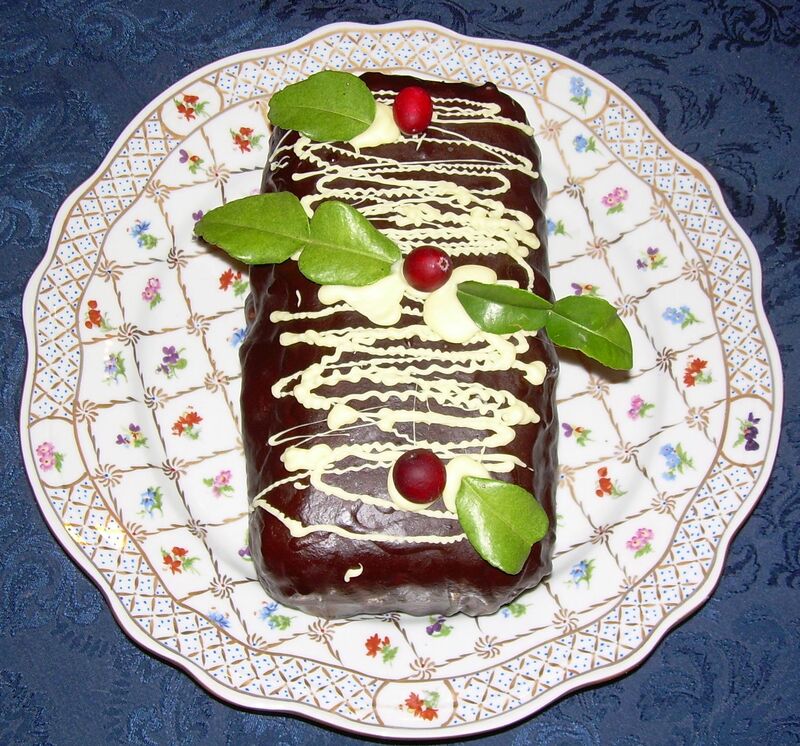 It all sounds and looks delicious, and I can honestly say you are a far more daring baker than I will ever be for 1. attempting this challenge and 2. attempting it in December! Of course you did more than attempt and your finished product is delightful and no doubt delicious. The log looks great! Happy New Year!